Drake just dropped a new track and it's breaking streaming records. Representatives for the rapper on Wednesday said "God's Plan" broke Spotify's U.S. record for the most-streamed song in a single day with 4 million plays, while Apple Music's Zane Lowe seemingly one-upped that announcement by saying the song logged 14 million streams worldwide. Drake's rep informed Billboard of the new Spotify record earlier today, confirming the track's performance surpassed that of Taylor Swift's "Look What You Made Me Do." While 4 million streams in one day is a significant feat, the Spotify figure is eclipsed by Apple Music's numbers, which saw the track garner more than 14 million plays on Tuesday. Apple Music DJ Zane Lowe shared the news in a tweet on Wednesday. It should be noted that Spotify's 4 million streams are attributed to plays in the U.S., while Lowe's comments apply to worldwide Apple Music numbers. Spotify has not released worldwide figures for "God's Plan," while Apple Music failed to disclose U.S. metrics. Whatever the final tally, the real winner is Drake, who appears to have another hit album on his hands with Scary Hours. Since its debut, Apple Music's install base has trailed that of market leader Spotify. In July of 2017, Spotify reported its paid subscriber base stood at 60 million with 140 million active users, a number that has since grown to over 70 million. In comparison, Apple Music notched 30 million paid subscribers as of September 2017, up from 27 million in June of that year. 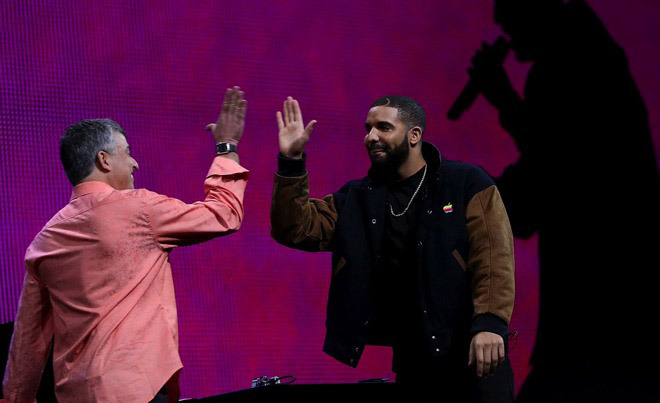 Beyond "God's Plan," Drake is a long-time Apple collaborator with partnerships dating back to 2015 when he performed as a guest DJ on iTunes Radio. More recently, the rapper is said to be working with fellow musician Future on an undisclosed Apple Music project. Details surrounding the initiative are murky, but the duo is rumored to be interested in original video content.